Get students in formation for BOOT CAMP! 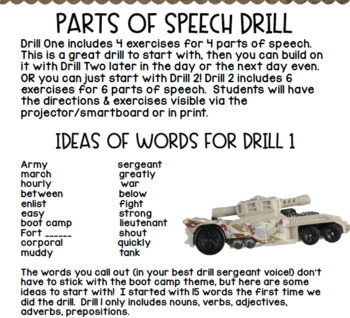 This activity includes two different Parts of Speech Drill. You will call out words from the included list and students will determine the part of speech to complete an exercise. The parts of speech and exercises that coordinate are ready for you to show on your projector screen or Smart Board. The words you call out (in your best drill sergeant voice!) 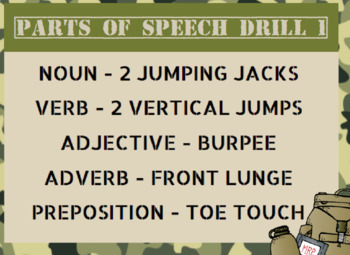 don’t have to stick with the boot camp theme, but included are a list of words to start with! I started with 15 words the first time we did the drill. Drill 1 includes nouns, verbs, adjectives, adverbs, prepositions. 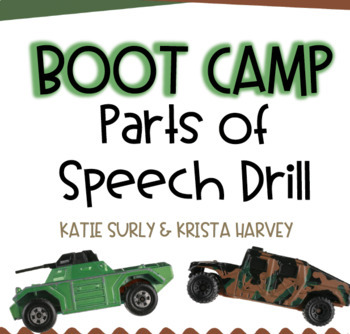 Drill 2 includes the parts of speech from Drill 1 + interjections and conjunctions as well. If you are interested in more, check out our full Boot Camp Literacy Review (GREAT for ELA Test Prep)!